Run Carbon GFO or any other media in the Red Sea Filter Media Cup. 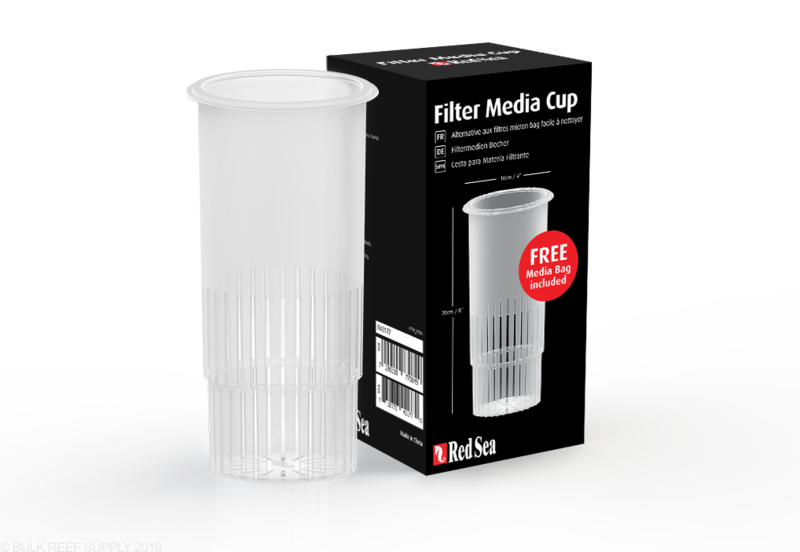 Pack the Red Sea Filter Media Cup with filter floss, ceramic media, carbon, gfo, or any other media you want. The slots at the bottom half of the cup force water to flow down through your media before it can freely exit. With the included media bag, you can manipulate your aquarium's water to go through a wide variety of media, carbon to help remove any toxins or yellowing pigments in the water, GFO to help remove phosphates or a biological substrate like MarinePure for the added surface area. 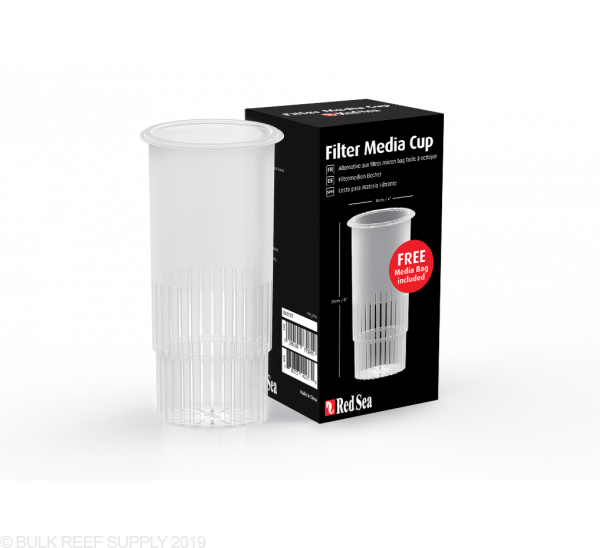 The Filter Media Cup is an ideal and cost-effective replacement to filter socks as well. If all you want is to polish the water of free-floating particles, then placing a few handfuls of a filter pad in the cup is all you need to do, merely replace the dirty pads every few days. Dimensions - 4" x 8"
Min Sock Opening - 3.5"
Media Bag Size - 5" x 10"
I own a Redsea Reefer 250 and These are awesome! They are very well made, fit perfect and do exactly what they are suppose to do. I added marine pure balls and filters floss on the top. I change them every week and they do not overflow like the other brands. If they do for you adjust your return pump flow. So happy to throw away my collection of old filter socks that I spent half my life cleaning. The cups roooool!!! The product itself is fine and the included sock is a nice touch although pretty expensive for a plastic cup. I prefer a very pristine tank and the original mesh socks from Redsea did not meet my needs. I bought several sets of the 200 micron felt socks which do a great job of cleaning the water of particulates and last me about 6 days before they are overflowing. I tried these because cleaning the socks is somewhat of a pain. I filled each cup with filter floss and with great disappointment, had the cup over flowing the next day. I packed less in the second time and managed to get two days. The real issue is that only the top of the floss gets dirty before it overflows as compared to the socks which get uniformly dirty over the entire inner surface. Since I try not to be too wasteful, I ended up washing the floss which obviously defeats the purpose of these cups. Seems like the roller mats might be the ultimate solution if you can fit and afford one. These are an answer to washing filter socks. Not only can you use floss as previous reviews mention, with the included media bag it's a good place for carbon, gfo etc... The only drawback, it's a tight fit in CPR sumps and filtersock holders. A shorter 4" version would be nice. The filter socks that come with the read sea tanks are terrible. They allow so much through that they are useless. Regular filter socks don’t fit perfectly and have to be cleaned 24/7. Cups are the way to go!! Put some floss in there and just pitch it when it’s dirty then fill it back up. Won’t ever do socks again. I currently use the BRS branded filter sock mount & socks. Can this filter cup be held in place by the BRS mount?